As we watched the funeral and memorial events honoring Senator John McCain, one thing enormously clear was that John McCain wanted to send a powerful message to America – one final word – as he left this earth. But is the message America received the one McCain intended? McCain’s memorial remembrances were filled with themes of unity, inclusion, and compromise. They stressed how McCain was someone who could reach across the aisle, find consensus, and put differences aside to bring people together for the greater good.It’s too bad McCain’s final actions contradicted that message. It was no secret that McCain and Donald Trump did not get along. In the short time that Trump and McCain had to work together, it was a very strained and contemptuous relationship. Ultimately John McCain banned President Trump from his funeral. For someone who was seen as Old School, with great importance placed on decorum, respect and appropriate behavior, what message does snubbing the President of the United States send to America? What happened to putting differences aside for the greater good? It wasn’t just President Trump McCain slighted in his last words and edicts. Sarah Palin, John McCain’s running mate in the 2008 Presidential race, was excluded from all of the memorials. Also banned were three of the most prominent members of his 2008 presidential campaign — campaign manager Steve Schmidt, senior adviser Nicolle Wallace and longtime strategist John Weaver. Actions speak louder than words, and it would have benefited McCain to have considered that in the decisions he made regarding his own memorial and the message he hoped to leave the country. 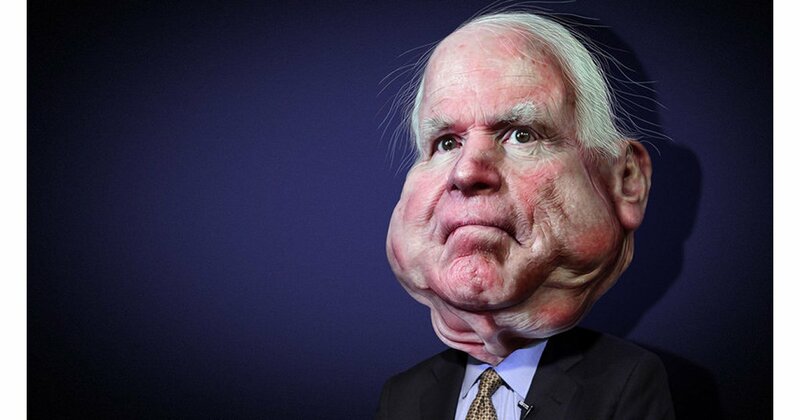 Instead, McCain’s actions represent what is wrong with politics today. John McCain was one of the political class who couldn’t understand why and how President Trump won the Oval Office, an ambition he never was able to achieve. Trump was a man who went against the rules, against the code of conduct that McCain and others on Capitol Hill felt was essential – and he won. The political elite just couldn’t come to grips with how his NOT playing by the rules, made him successful. This inability to understand the Trump phenomenon comes from their inability to truly understand the American people and what is going on in this country today. Call it the DC bubble or willful ignorance, but the American people have been screaming for years at them, telling them what they want, what issues matter to them. “The swamp” ignored them. Trump listened. Trump got it. And that is why Trump won a victory most never thought possible. Senator McCain had a perfect opportunity to be the “maverick” of his reputation. He could have been the unifier. He could have done the right thing by allowing even those he had unresolved issues with, differences with, to come and pay their respects and to honor him. He could have shown the country, not just in words but in action, that no matter how great the differences we have with one another, we can move beyond them, beyond the anger, bitterness, pain, even our own pride and ego, to come together to do what is best for America. John McCain could have done all these noble things. But he didn’t. Felicia Tweedy is a political activist and professional who has served elected officials and campaigns on both sides of the aisle, and an entertainment industry professional. The article originally appeared in Eagle Action Report and is reprinted with permission of the author.